Beatrice Aighewi receiving the award on behalf of DG Sanginga from FACAN President Dr Victor Iyama. Receiving the award on his behalf, Beatrice Aighewi, Yam Seed Systems Specialist, thanked the organizers of the AGRIKEXPO for acknowledging the hard work of Dr Sanginga in leading research-for-development efforts towards the attainment of food security and job creation for youth along the agriculture value chains. “I thank you for this award. IITA is committed to transforming African agriculture and Dr Sanginga is not relenting until this task is done,” she said. IITA made a strong showing at this 7th edition of the AGRIKEXPO in Abuja organized by the Federation of Agricultural Commodities Associations of Nigeria (FACAN), an umbrella body of 45 agri-food associations in Nigeria, with support from the Federal Ministry of Agriculture and Rural Development (FMARD), Federal Ministry of Trade and Investments (FMTI), the National Agency for Food and Drugs Administration and Control (NAFDAC), the Standards Organisation of Nigeria (SON), and the Nigeria Agribusiness Group (NABG). 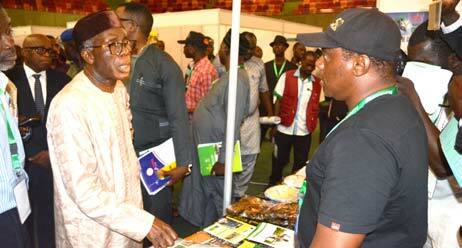 Minister of Agriculture, Chief Audu Ogbeh, visiting the IITA stand. The Honorable Minister of Agriculture, Chief Audu Ogbeh was among dignitaries who visited the IITA stand. Various crop yield improvement and product development technologies being promoted by IITA were showcased, including a display from AfricaRice, with technologies from the IITA-led outreach program of the Nigeria Agricultural Transformation Agenda Support Program Phase One (ATASP-1). 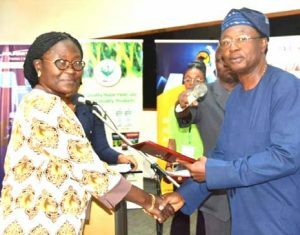 At the close of AGRIKEXPO 2018, which was held at the International Conference Centre Abuja, on 18-20 September, IITA’s contribution was acknowledged with an AGRIKEXPO 2018 Certificate of Participation.